The Ibis Ripley LS has been rebooted. The 3.0 version builds on the Ripley LS reputation and adds only a few small tweaks in order to upgrade and enhances its versatility and performance. The 3rd Generation Ripley has an all-new swingarm and clevis, and a wider upper eccentric. The swingarm will now accommodate 29" tires up to 2.6" wide such as the Schwalbe 2.6" Nobby Nic. You already know that the frame accommodates any 1x drivetrain set up, but even with the new wider eccentrics, the swingarm will accommodate the 2X Shimano side swing front derailleurs including Di2. The 3.0 retains the nimble, light and responsive trail geometry of its predecessors, and makes it one of the most playful and capable twenty-niners out on the trails today. Constructed of high-quality carbon fiber, the Ripley frame is incredibly lightweight, will absorb trail shock, and, oh yes, she is pretty. At the heart of the Ibis Ripley LS is the eccentric DW- Link Suspension. With 120mm of travel, it gobbles up debris on the trails, while preserving pedaling efficiency. The DW- Link features excellent small bump compliance and predictable travel through the range with no walling or harsh bottoming out. To ensure superior maneuverability and stability, the Ripley LS has a tapered head tube and boost 148mm dropouts. 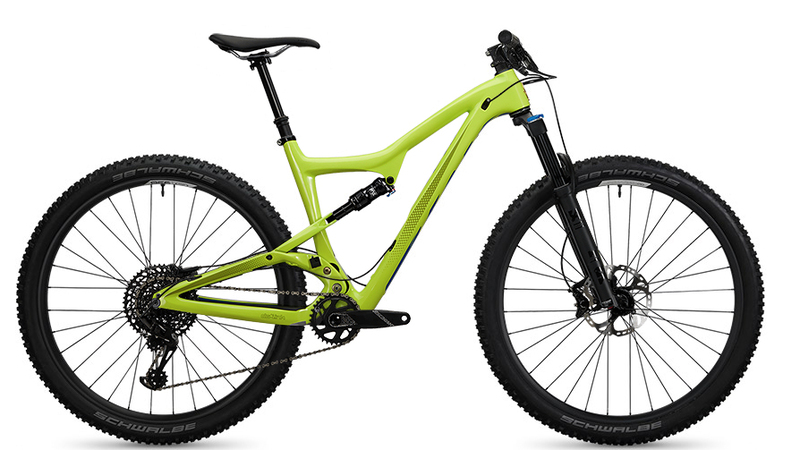 The Ripley 29 LS 3.0 is definitely a bike you'd take home to meet your mother. Just keep it on a short leash. Increased tire clearance for up to 29 x 2.6 tires. SRAM GX Eagle 1x12 drivetrain delivers simplicity and reliability from the company that invented the 1X system. 2017 Fox Performance 130mm Fox 34 Fork is a lightweight platform designed for aggressive trail riders. Boost 148 rear axle spacing allows the tire clearance, keeps chainstays short and stiffens things up for higher performance and ride feel.